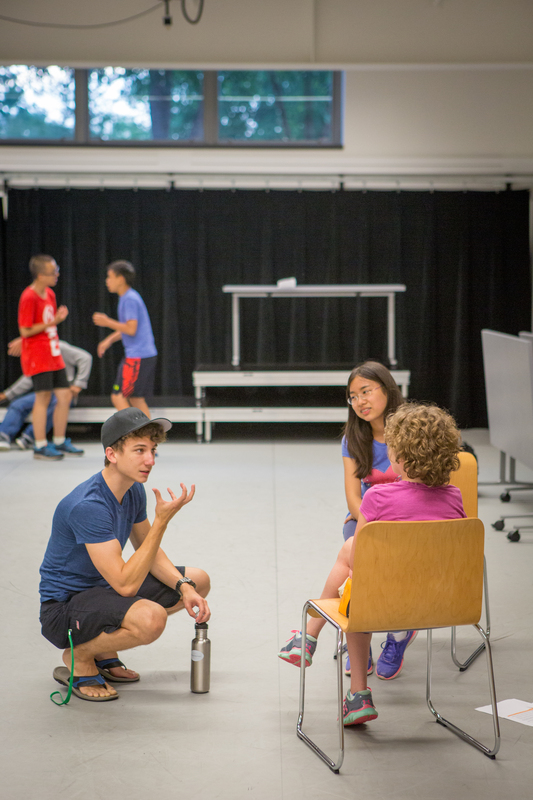 An innovative middle school summer program, the Experimentory at Deerfield Academy allows students to delve into project-based, creative learning. We focus on collaborating and communicating, fostering creativity, and developing how we look at the world. It’s also a great chance to sample a top boarding school. Located in Deerfield, Massachusetts, the Experimentory follows the motto: The Experimentory: Maximize Your Creativity and Character or E = MC2. As we help our middle schoolers strive to take creative risks and be their best selves, we also allow them to Sample Deerfield – a premier New England boarding school. Oh, and we have a lot of fun. From there, the best way to learn to be creative is by... well, creating. Our learning is project-based, so our classrooms are more lab than lecture hall. In years past, our student projects have included designing hydroponic systems for a Mars Colony; designing a restaurant and learning to prepare the food on its menu; and planning an in-class debate on the ethical dilemmas of human genetic engineering. Through these, students learn how creative people work - through playful experimentation, trial and error, and refining plans and designs. All of our projects are the work of collaborative teams. As we learn to work together, we refine ourselves as much as we refine the prototypes, building designs, or theatre productions we are working on. There are six character attributes we consider essential to our classwork: Curiosity, creativity, grit & resilience, initiative & independence, effective discussion & teamwork, and disciplined work habits. But character building doesn’t just happen in the classroom. We also live, eat, and play together. One of the beauties of boarding school is the way all parts of life intersect. We fully embrace that and spend our summer exploring what it means to be generous, kind, empathetic, and more. Deerfield Academy is more than our physical location – it is part of our mission. The Experimentory serves our students as an opportunity to experience boarding school and Deerfield Academy. Any students considering boarding school for high school will leave with a better sense of what it is like to be away from home, live with classmates, and manage boarding school independence and responsibilities. All of our teachers and campus staff members are current Deerfield Academy employees. Many of our college-aged Teaching Assistants and Residential Assistants are former Deerfield students. Together we create a genuine Deerfield Experience through traditions, values, and life balance. The Experimentory at Deerfield Academy consists of two sessions and students may enroll in either or both. Students staying for a single session will choose two classes. Students staying for four-weeks may choose to take multiple two-week classes or take more in-depth four-week classes. A day program is available for students living within driving distance. The program cost includes all classes, field trips, and off-campus excursions. Boarding student tuition also includes all room and board. International students and others who need to purchase a US-based health insurance for the duration of our program can do so for an additional fee. We also provide students with personal accounts to hold spending money for incidentals, such as snacks from the campus cafe, items from the school store, and souvenirs when traveling off campus. The Experimentory offers a limited amount of financial assistance for domestic students. Financial aid is based on need and is applied for along with the program application. We give tuition grants to all types of students – both two-week and four-week students; both day and boarding students. All students applying for financial aid must apply for both the program and financial aid by February 1, 2019 to be considered. Financial aid applicants will be notified of their admissions decision and financial aid decision together via email by February 15, 2019. A unique opportunity for your children to explore interests and challenge themselves in a variety of ways. It has been such a positive experience for my child, navigating over 4 weeks from the initial excitement and anticipation, to being slightly out of her comfort zone,to being open to new experiences and now not wanting to leave!!! So grateful to everyone that made it possible for her to participate. High caliber summer program combining education and creativity. A positively impactful and life changing month for our son. Your request will be sent directly to The Experimentory at Deerfield Academy.